The Communist-era KAP smelter was once one of the most profitable and renowned companies in Montenegro. After the fall of Communism in Yugoslavia and its subsequent dissolution, a wave of suspiciously managed privatizations destroyed most of the once-renowned companies. KAP was no exception, and became a victim of post-communism mismanagement and inadequate privatization processes. KAP was sold to a local entrepreneur in 2013, leaving hundreds of workers without their jobs and pensions packages. Democratic Front Party MP, Janko Vučinić, led the protest of KAP ex-workers in front of the parliament building. According to the Montenegrin Media, MP Vučinić invited all protesters to enter the parliament building. Clashes of protesters with the police were preceded by police’s warning that they would not allow entrance to the parliament. 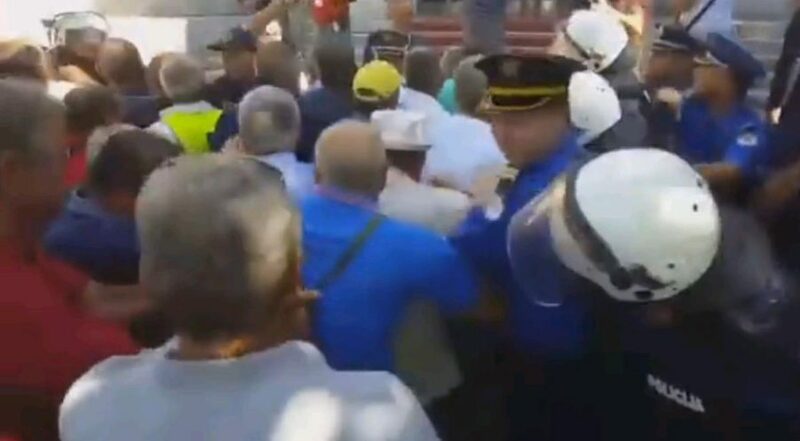 Police used pepper spray against dozens of protesters who attempted to storm the parliament building, resulting in several protesters being hospitalized. The Speaker of the Montenegro’s parliament, Darko Pajović, resolved the crisis by inviting MP Vučinič and one workers’ representative to a meeting in the parliament building. The meeting concluded with a deadline being set for the government to resolve the issue of the workers’ unpaid severance. KAP ex-workers announced blockades of traffic throughout the Montenegrin capital, Podgorica. Yesterday, August 29, they blocked two major crossroads in Podgorica for six hours. According to the representatives of the KAP ex-workers, they blame the government and Montenegro’s Prime Minister Milo Đukanović for the unpaid EUR 5.45 million severance package; they apologized to all Podgorica citizens for the inconvenience, but promised protest radicalization if their demands are not meet by the deadline.